tool for determining whether a surface is horizontal. It consists essentially of a slightly bent transparent tube that is held in a frame. The tube contains some alcohol, ether, or similar fluid but is not entirely filled, so that it also contains a small bubble. (gorizont, horizon), in mining, the totality of mining developments located at one level and designed for carrying on mining work. By their purpose in the mine the following levels are distinguished: the hauling level (for transporting loads and moving people), the airway level (for ventilating the mine), the discharge level (for discharging broken-up ore), the cutting level (for opening up a rock mass from below in order to cave it in or break it up), and the scraper level (for scraper delivery of broken-up minerals to the loading point). For open-pit extraction of minerals the primary mining equipment for working one bench is installed on a level (the so-called work level of the quarry). a geodetic instrument used for measurement of the elevation of points on the earth’s surface (leveling) and for establishing horizontality during erection and installation operations. The most common levels are opticomechanical levels, which have a sighting tube that is used for readings from a rod. 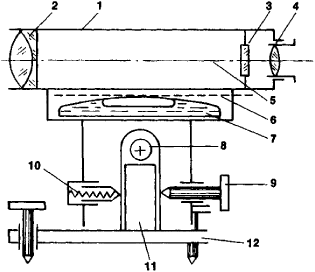 Before taking the reading, the sight line of the sighting tube is set on the horizontal by means of the spirit level; in levels with self-leveling sight lines, this is done automatically. make it easier to set the spirit-level bubble at the zero point and to increase the precision of the instrument (see Figure 1). In this type of arrangement, all the parts that connect the sighting tube to the horizontal axis form the stand. A distinction is made among high-precision, precision, and engineering levels, which produce errors not greater than 0.5–1.0 mm, 5–8 mm, and 15 mm, respectively, per kilometer of level line. Hydrostatic levels, based on the principle of communicating vessels, are sometimes used. There have been many attempts to make automatic levels, which determine elevation by integrating the angles of dip along a route traveled across the terrain by bicycle, motor vehicle, or other vehicle; however, as of 1974 the results have not been acceptable. Gusev, N. A. Marksheidersko-geodezicheskie instrumenty ipribory, 2nd ed. Moscow, 1968. Deimlikh, F. Geodezicheskoe instrumentovedenie. Moscow, 1970.
in linguistics, any one of the basic planes of a language system—phonemes, morphemes, words (lexemes), and phrases (tagmemes)—considered as objects of linguistic analysis and constituting the province of phonology, morphology, lexicology, and syntax. Levels of language are determined by the characteristics of units isolated in the continuous articulation of running speech. Some scholars seek to increase the number of levels by raising to the status of a separate level any of the complex units capable of isolation; others consider only two levels to be significant—the differential and the semantic. On the differential level, language appears only as a system of contrasting signs that include, besides the natural sounds of speech, the written signs that distinguish units on the semantic level. On the semantic level, morphemes, words, and combinations of words are distinguished as two-sided units, that is, with regard to their acoustic aspect, or expression, and to their internal, semantic, aspect, or content. Urovni iazyka i ikh vzaimodeistvie: Tezisy nauchnoi konferentsii (Apr. 4–7, 1967). Moscow, 1967. Martinet, A. “Arbitraire linguistique et double articulation.” Cahiers Ferdinand de Saussure, 1957, no. 15. Benveniste, E. “Les Niveaux de l’analyse linguistique.” In Proceedings of the Ninth International Congress of Linguists. The Hague, 1964. Buyssens, E. “La Sextuple Articulation du langage.” Ibid. an instrument for checking the horizontal position of planes and for measuring small angles. A level consists of a bar with a vial located inside; the vial is filled with alcohol or ether, except for a small gas bubble. If the lower plane of the level is positioned horizontally, the bubble will rest in the center of the vial. Levels with two vials can be used simultaneously to check the horizontal position of two planes that are mutually perpendicular. Some levels have the shape of a cylinder, the top of which is hermetically sealed by glass. The inside of the glass is spherically ground, and the box is filled with a fluid with a gas bubble. If the base of the box is positioned on a true horizontal, the bubble will rest in the center of the glass cover. Levels used in machine building include mechanic’s levels and frame levels. In the former, the leveling vial is equipped with a scale and mounted within the housing. The level also has a fixture that adjusts the location of the vial with respect to the base of the housing. The position of the end of the bubble on the scale defines the inclination angle of the plane on which the level is placed. A prismatic recess in the base makes it possible to mount the level on cylindrical surfaces. A frame level consists of a four-sided frame with precise right angles; the leveling vial and the adjusting fixture are located in the lower part of the frame. Frame levels can be used on horizontal or vertical surfaces. Levels with one or two leveling vials are used in construction work to check the correct location of parts of the buildings and structures being erected. Levels are an important tool in astronomy, geodesy, and physics. They are used in leveling, in determining the inclination angles of horizontal axes, and in measuring the change of the angle between the vertical axis and a sighting line. Levels used in astronomy have a scale for angle measurements marked on the vial; the scale divisions are usually in units between 1 minute and 1 second. Gorodetskii, Iu. G. Konstruktsii, raschet i ekspluatatsiia izmeritel’nykh instrumentov ipriborov. Moscow, 1971. Blazhko, S. N. Kursprakticheskoi astronomii, 3rd ed. Moscow, 1951. A surveying instrument with a telescope and bubble tube used to take level sights over various distances, commonly 100 feet (30 meters). To make the earth surface horizontal. A specified position on an amplitude scale (for example, magnitude) applied to a signal waveform, such as reference white level and reference black level in a standard television signal. The status of a data item in COBOL language indicating whether this item includes additional items. A device consisting of a bubble tube that is used to find a horizontal line or plane. Also known as spirit level. A single bank of contacts, as on a stepping relay. The difference between a quantity and an arbitrarily specified reference quantity, usually expressed as the logarithm of the ratio of the quantities. A charge value that can be stored in a given storage element of a charge storage tube and distinguished in the output from other charge values. Mine workings that are at the same elevation. A gutter for the water to run in. In factorial experiments, the quantitative or qualitative intensity at which a particular value of a factor is held fixed during an experiment. 1. A surveying instrument for measuring heights with respect to an established horizontal line of sight; consists of a telescope and attached spirit level, a rotatable mounting, and a tripod. Also see wye level and dumpy level. 2. The position of a line or plane when parallel to the surface of still water. 4. Of an acoustical quantity, 10 times the logarithm (base 10) of the ratio of the quantity to a reference quantity of the same physical kind. i. A generic term relating to vertical position of an aircraft in flight and meaning variously, height, altitude, or a flight level (ICAO). ii. To bring an aircraft into a horizontal line of flight, such as in to level off or level out.